Lake Garda is the largest lake in Italy and is surrounded by many medieval villages, small towns and picturesque ports. Many of them can be reached by boat from various parts of the lake and it’s definitely worth exploring as many of them as you can to get a truly authentic feel for the stunning area. Peschiera is on the southern end of the lake. Here, you can see the 16th century island fortress and walls, a reminder of a time when Austria controlled the region. Guided tours of the fortress are available by boat or on foot. The old town is colourful and inviting with narrow alleyways lined with shops and cafes. After soaking up the history try a glass of Lugana, a local white wine. Nicola, our Italian campsite specialist, lives in Italy and spends much of her summer visiting our Italian campsites. We asked her to give us some insider tips on Lake Garda. Lake Garda is not only Italy’s largest lake but also one of the most scenic and action-packed holiday spots in Europe. Take your pick from water sports, Roman ruins, theme parks, and amazing food and wine. Lake Garda lies in a deep valley in northern Italy between Venice and Milan. The ladle-shaped expanse of water is 50 miles long and 11 miles across it’s widest. The southern part of the lake features rolling hills with olive and citrus groves fringing the shores. Heading north, the hills give way to majestic mountains. The lake was formed during the last Ice Age by a massive glacier that flowed down from the Dolomites, cutting through and gouging out the valley. Eventually the ice glacier melted, resulting in the freshwater lake of today. Holiday memories are priceless and it’s the best feeling enjoying new experiences in new places. Over the next few weeks, we’re counting down our top ten things to experience on a Canvas Holiday. 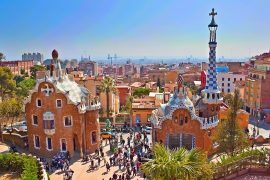 Barcelona is the dynamic, vibrant and colourful capital of Catalonia. The city is an absolute must-see on a visit to this area for its stunning architecture and cosmopolitan atmosphere. The pride of Barcelona is the famous architect Gaudí who is responsible for many of the city’s amazing buildings. The most famous of these is the incredible Sagrada Familia (the sacred family) which was consecrated as a Basilica in November 2010. Remarkably, it’s been under construction since 1882, when the first stone was laid but there is talk that it may be completed by 2026 – just a 144 year project. Other notable buildings displaying the unique designs of Gaudi are Casa Batlló, which has a wonderfully colourful and curvy façade and Casa Mila which was declared a UNESCO World Heritage site in 1984. No visit to Barcelona would be complete without spending some time in Parc Guell. The vibrant colours and wonderful shapes make this park truly unique. Laura Brasó, our former Spanish campsite specialist and Barcelona native, gives us the lowdown on some of her favourite places in the Costa Dorada and shares her insider tips on making the most of this region. In the Costa Dorada, Playa Bara has an amazing pool complex, Tamarit Park is located right on the beach, next to a gorgeous Castle and Cambrils Park has first-class facilities and a very cool accommodation type: the Hawaiian-style Aloha Bungalows. 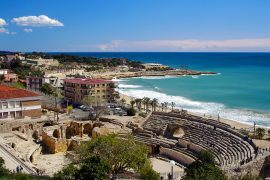 In the Costa Dorada, Tarragona is a UNESCO World Heritage Site and a must-see, as is the medieval walled town of Montblanc with the nearby Cistercian monastery of Poblet (founded in 1151). The Ebro Delta Natural Park is a protected wetland reserve that’s comparable to the Camargue in France. And of course, there’s PortAventura theme park. “Joining Canvas holidays at the beginning of 2014, I decided to take a trip to Cambrils Park with my girlfriend at the end of August that year. I was curious to fully experience what Canvas had to offer, and how it compared to the information back in the office. My first Canvas holiday lived up to the hype – Cambrils Park was great. It had everything you could have asked for in a holiday. 10 minute walk to the beach, 30 minute walk from the lively town of Salou and 45 minutes from the seaside town of Cambrils.The campsite was great too.